we pray you please to help us as His fair praise we sing. We lift our hearts in joyous song to honor Him this way. And while we sing, remembering, to sing is to doubly pray. This saint, so often glorified in the fine arts and in poetry, is one of the most venerated martyrs of Christian antiquity. 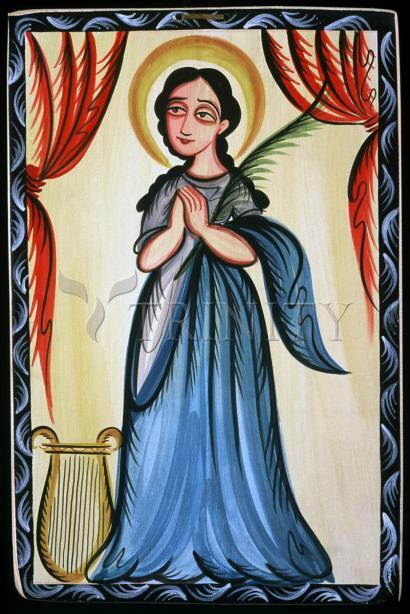 The oldest historical account of St. Cecilia is found in the "Martyrologium Hieronymianum"; from this it is evident that her feast was celebrated in the Roman Church in the fourth century. Her name occurs under different dates in the above-mentioned martyrology; its mention under 11 August, the feast of the martyr Tiburtius, is evidently a later and erroneous addition, due to the fact that this Tiburtius, who was buried on the Via Labicana, was wrongly identified with Tiburtius, the brother-in-law of St. Cecilia, mentioned in the Acts of her martyrdom.